Forrás: Good Housekeeping. Szerző: Sarah Schreiber. When you’re visiting a country known for henna tattoos, it’s hard to resist getting one yourself. Unfortunately, one woman learned the hard way that these seemingly fun designs can do some serious damage. If you take one look at Sophie Akis’s hands shortly after she received a black henna tattoo in Morocco, you’ll see what we mean. Akis and her husband returned to the pharmacy, desperate, and were told to go to a local hospital. Officially out of Moroccan currency, Akis knew that wasn’t an option, so after being washed, swathed in iodine and bandaged at the pharmacy, she began the 24-hour journey home to Turkey. Upon arrival, she went straight to the hospital. After being evaluated by a skin specialist, she was given a powder to mix into sterilized water and was instructed to wash every five minutes for two days. After 11 days, Akis’s hands are still not back to normal — she’s dependent on a fucidin cream, an antibiotic ointment, to ward off infection and may sustain permanent scars. Even if you don’t have an allergy to hair dye, it’s best to stay away from black henna — and the American Academy of Dermatology Association (AADA) agrees. 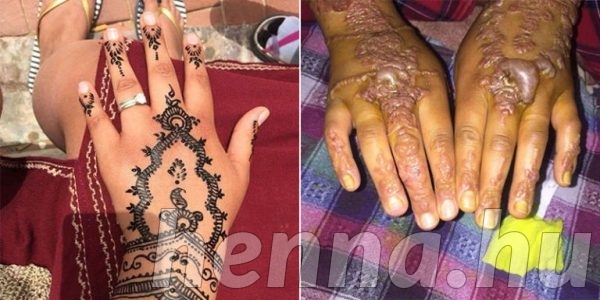 In 2008, the AADA endorsed banning “the practice of applying paraphenylenediamine-adulterated henna tattoos” for its highly toxic, severe-reaction inducing properties. After all, true henna, derived from a flowering plant native to certain parts of Africa, Australia and Asia, is brown — never black.